♥ Florence & The Machine notebooks, around $12 for a set of 6 from Typo. Longtime readers of the blog will know how much I love Florence & The Machine so these notebooks are perfect. They are a reasonable size, lightweight & will be great for jotting down notes during tutorials & working on assignments at home. They all have gorgeous photographed or illustrated covers too which is a bonus. ♥ Tangle Teezer Compact styler, available here. Nobody likes a bulky hairbrush, especially when the bristles are going to get caught on everything in your bag! Bring in the tangle teezer. This compact version is the perfect size for handbags & has a cover so the bristles don't get damaged on anything. This is an absolute staple as my hair always gets windswept walking to & from campus. 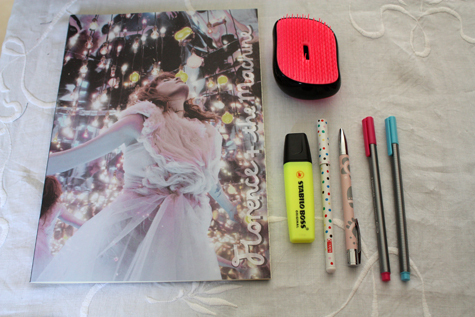 ♥ An assortment of pens, highlighters & memo notes housed in my glittery pencil case. I always carry two or three black pens with me & then a selection of colours. Since high school I've been using coloured pens to brighten up my notes & make them more appealing to read. They're also handy if you have anything like presentations to work on as well. ♥ Kikki K Cute Diary. This bright, beautifully illustrated diary is going to be cute to look at & also perfect for housing any reminders, homework & things I have to do during the semester. *Is it becoming obvious that I like stationery to look beautiful? ♥ Chain Trim Purse from Topshop, purchased in a sale but available here. Since my first what's in my bag post I purchased a new wallet. My floral one was falling to bits & I fell in love with this one. It houses cards & occasionally notes but more often loose change. That Starbucks card you see gets plenty of use before early morning classes. ♥ Sunglasses, gifted from Sunglasses Shop. Sunglasses are an absolute staple in anyone's bag, but for the University student they are perfect for when you want to hide tired eyes. This pair is also such a classic style, I love them! So there you have it, that's what's in my bag when I'm studying. 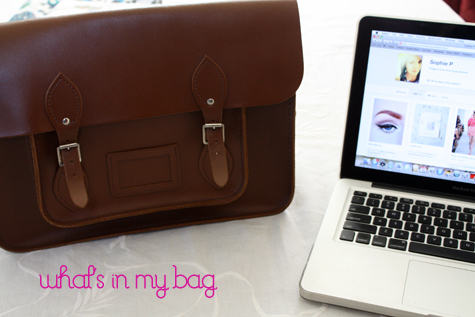 To see my first what's in my bag post click here & to see my travel makeup bag post click here. ♥ I hope you all have an amazing week! Today I've been catching up on jobs, posting packages aplenty at the Post Office & admiring gowns on the Oscars Red Carpet xo.